Fabric can be dyed in several ways: whole cloth dyeing, tie dyeing, resist techniques (e.g., batik), painting dyes on fabric, marbleizing, and silk screening, to name a few. Some of these techniques are also used to dye yarn and fibers. The type of dye used depends primarily on the type of fiber. Dye classes include natural dyes, mordant dyes, fiber-reactive dyes, direct dyes, acid dyes, basic dyes, vat dyes, and azoic dyes. With many of these dyes, dyeing assistants and other chemicals are necessary. Our data sheet on this topic will include a table of known hazardous dyes listed by their Color Index number. 1. Most dyes have not been adequately studied with respect to their long-term hazards, especially cancer risk. The major risk is inhalation of dye powders. 1. Buy dyes in liquid or paste form whenever possible to eliminate inhalation risks. 2. Mix dye powders inside a glove box, inside an enclosed hood, or wear a NIOSH-approved toxic dust respirator. 3. Wear gloves when handling dye solutions. 4. If the dyebath is heated near boiling, install a canopy hood over the dyebath. 5. Clean up powdered dye spills by wet mopping. Acid dyes are used for wool, silk, and sometimes nylon. 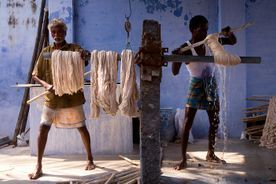 Sulfuric acid, vinegar, or diluted glacial acetic acid, and sometimes common salt or Glauber's salt (sodium sulfate), are used as dyeing assistants. The temperature of the dye bath can be simmering (140 F or 60 C), or at a boil. Acid dyeing is also done at 90-100 F (32-38 C). 1. In general, the long-term hazards of many of these dyes are unknown. Many acid dyes used to be food dyes, which have been shown to cause liver cancer in animal studies. 2. Glacial acetic acid and concentrated sulfuric acid are highly corrosive by skin contact, inhalation, or ingestion. Vinegar and dilute sulfuric acid are only slightly irritating by skin contact; repeat and long-term inhalation of the acetic acid and sulfuric acid vapors may cause chronic bronchitis. Splashing hot or boiling dye bath containing acid into the eyes could be extremely hazardous. 3. Glauber's salt (sodium sulfate) is only slightly toxic by ingestion, causing diarrhea. 1. Use vinegar as a dyeing assistant rather than diluting glacial acetic acid or using sulfuric acid. 2. If you dilute concentrated acids, always add the acid to the water. Wear gloves, goggles, and a protective apron. An eyewash fountain and emergency shower should be available. 3. Wear goggles when dyeing at high temperatures to avoid splashing hot liquid in your eyes. 4. Boiling dye baths should be exhausted with a canopy hood, since the steam can carry dye with it into the air. Azoic dyes, or naphthol dyes as they are also called, are used to dye cotton, linen, rayon, silk, and polyester. They consist of two components - "fast salts" and "fast bases" – which must react together on the fabric to form the dye. Dyeing assistants used with these dyes are lye and Monopol oil (sulfonated castor oil). 1. Azoic dyes are very reactive, and may cause severe skin irritation (dermatitis, hyperpigmentation). Long-term effects of these dyes have not been well studied. 2. Lye (sodium hydroxide) is highly corrosive by skin and eye contact and ingestion. 3. Sulfonated castor oil is moderately toxic by ingestion. 1. If possible, avoid azoic dyes. Most other types of dyes are less hazardous. Basic dyes, also called cationic dyes, are used to dye wool, silk, and cellulosics that have been mordanted with tannic acid. They are sometimes found in all-purpose household dyes. Most fluorescent dyes are basic dyes. 1. Some basic dyes are known to cause skin allergies. Whether they cause respiratory allergies if inhaled is not known. Direct dyes are used for dyeing cotton, linen, or viscose rayon. They use ordinary table salt (sodium chloride) as a dyeing assistant, and require heat during the dyeing process. Direct dyes are azo dyes. In the past, a large number of direct dyes, particularly dark shades, were made from benzidine. Dyes based on benzidine derivatives (3,3'-dimethoxybenzidine, and 3,3'-dimethylbenzidine) may still be available. Direct dyes are the commonest dyes used by craftspeople, and are present in all household dye products. 1. Benzidine and benzidine-derivative direct dyes are highly toxic by inhalation and ingestion, and possibly through skin absorption. Bladder cancer may be caused by the breakdown of these dyes by intestinal bacteria and also by the liver to form free benzidine, one of the most powerful carcinogens known in humans. It has been shown that workers using these dyes have free benzidine in their urine. Another source of concern with imported benzidine dyes is that they have often been found to be contaminated by free benzidine. The CSA's more detailed data sheet on Dye Hazards contains tables of known hazardous dyes listed by their Color Index names and/or numbers. 2. The long-term hazards of other types of direct dyes are unknown. 1. Do not use direct dyes based on benzidine or benzidine derivatives, if known. Disperse dyes are used to dye polyester, nylon, and acetates. They are often applied at high temperatures. 1. Many disperse dyes are known to cause skin allergies, even from skin contact with the dyed fabric. Fiber-reactive dyes, or cold water dyes, are dyes that work by reacting chemically with the fiber, usually cotton or linen. These dyes use sal soda or washing soda (sodium carbonate) for deactivating the bath after dyeing. Other chemicals often used are water softeners, urea, and sodium alginate (as thickeners). 1. Fiber-reactive dyes can react with lung tissue and other mucous membranes to produce very severe respiratory allergies. Symptoms include tightness in the chest, asthma, swollen eyes, "hay fever," and possible skin reactions. These dyes are very light, fine powders, and are easily inhaled. 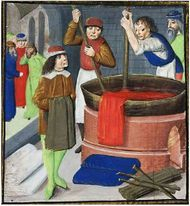 There have been many cases of craftspeople who have worked with these dyes for several years without problems and then suddenly develop a severe allergy. 2. Sodium carbonate is moderately corrosive by skin contact and highly corrosive by inhalation or ingestion. 1. Purchase liquid, fiber-reactive dyes instead of powdered dyes. 2. If possible, mix up a full package of the dye at a time rather than storing partly filled packages, Use a glove box or NIOSH-approved toxic dust respirator. 3. Wear gloves and goggles when handling sodium carbonate solutions. So-called French dyes are solvent-based, brilliant dyes often used for painting on silk. These are mostly based on ethyl alcohol, but Material Safety Data Sheets should be obtained to ensure this. 1. The solvents used are flammable. Ethyl alcohol is a mild respiratory irritant, and is only slightly toxic. Methyl alcohol is moderately toxic and is absorbed through the skin. It can affect the nervous system. 1. Only use dyes containing ethyl alcohol. Dilute the dyes with water, isopropyl alcohol, or denatured alcohol, not methyl alcohol. 2. Use with good dilution ventilation (e.g. a window exhaust fan at work level). 3. Do not allow open flames, lit cigarettes, or other sources of ignition around the solvents. All-purpose household dyes, also called Union dyes, are mixtures of several dye classes with salt that dye almost any type of fiber. The dye class that is not suited to a fiber will be left in the dyebath. 1. The hazards of household dyes depend on the classes of dyes present. Usually, this includes an acid dye and basic dye. Fiber-reactive dyes can also be present. Mordant dyes are synthetic dyes which, like some natural dyes, use mordants to fix the dye to the fabric. They are commonly used to dye wool and leather, and sometimes cotton. You can use the same mordants used with natural dyes. See Natural Dyes. Natural dyes are mordant dyes prepared from plants, insects, algae, and any other likely material. Most of these natural dyes are prepared by soaking plant, bark, or other material in water, or simmering for 1-2 hours. In some cases, such as with indigo, these dyes are also available synthetically. Natural dyes are used to dye cotton and silk fibers and fabric, and usually require the use of mordants to fix the dye to the fiber. Mordanting is usually done by simmering the fibers or other material in a mordant bath for 30-45 minutes. After mordanting, the material is dyed. Common mordants are alum (potassium aluminum sulfate), ammonia, blue vitriol (copper sulfate), copperas or green vitriol (ferrous sulfate), cream of tartar (potassium acid tartrate), chrome (potassium dichromate), oxalic acid, tannin (tannic acid), tin (stannous chloride), and urea. 1. The hazards of natural and synthetic mordant dyes are mostly unknown, particularly with respect to their carcinogenic effects. Usually there is no hazard due to inhalation, and the only problem is possible skin contact and absorption. Some plant materials, however, can release irritating vapors (e.g. eucalyptus). 2. Chrome (ammonium or potassium dichromate) is highly toxic. It is a probable human carcinogen, and can cause skin ulceration and allergic reactions. 3. Oxalic acid is highly toxic. It is corrosive, and can cause acid burns, ulcers, and gangrene in extreme case. It is hazardous by skin contact, inhalation, and ingestion. 4. Ammonium hydroxide is moderately to highly toxic. It is a skin, eye, and respiratory irritant. Mixing it with chlorine bleach produces a poisonous gas. 5. Copper sulfate (blue vitriol) is moderately to highly toxic. It may cause skin, eye, and respiratory irritation and allergies and possible ulceration. Acute ingestion usually causes vomiting; if vomiting does not occur, more serious poisoning can occur. 6. Alum (potassium aluminum sulfate), ammonium alum, cream of tartar (potassium acid tartrate), stannous chloride (tin chloride), tannic acid (tannin), and ferrous sulfate (copperas) are slightly toxic and may cause skin irritation or allergies in some people. Ferrous sulfate can cause iron poisoning in children. Urea has no significant hazards. 7. The hazards of using indigo are discussed under vat dyes. 1. Wear rubber gloves when mordanting, preparing dye baths, and dyeing. 2. Whenever possible, prepare your own dye bath by soaking wood, plant, and other natural dye sources rather than buying prepared dye powders. If you do use dye powders, use a glove box or wear a NIOSH-approved toxic dust respirator. 3. A safer, cold mordanting procedure can be done as follows: 1) dissolve the mordant in a small amount of warm water; 2) pour the dissolved mordant and cold water into a container with a tight lid or seal; 3) submerge the scoured fiber or other material, and secure the lid; 4) let sit for at least 12 hours; 5) remove the fiber and rinse thoroughly; and 6) dye the mordanted material or let dry. Vat dyes, including the natural vat dye indigo, are dyes that are insoluble in their colored form. They must be reduced to a colorless, soluble leuco form with lye or caustic soda (sodium hydroxide) or sodium hydrosulfite before they can be used for dyeing. Vat dyes are commonly purchased in their colorless reduced form. The color is produced after dyeing by air oxidation or by treatment with chromic acid (potassium dichromate and sulfuric acid). Vat dyes are used to dye silk, cotton, linen, and viscose rayon. 1. Vat dyes in their pre-reduced form are moderately irritating by skin contact, inhalation, and ingestion. Vat dyes may cause allergies. 2. Sodium hydroxide is highly corrosive by skin contact and ingestion. 3. Sodium hydrosulfite is moderately irritating by inhalation and ingestion. Its powder is very easily inhaled. When heated or allowed to stand in basic solution, sodium hydrosulfite decomposes to form highly toxic sulfur dioxide gas. 4. Chromic acid is highly corrosive by skin contact or ingestion, as are its separate components, sulfuric acid and potassium dichromate. It is a known human carcinogen, and can cause skin ulceration and allergic reactions. 1. Wear gloves and a NIOSH-approved toxic dust respirator when handling pre-reduced or pre-solubilized vat dye powders or sodium hydrosulfite. When possible, mix in a glove box. 2. Wear gloves and goggles when handling lye. 3. Do not store solutions containing sodium hydrosulfite. 4. Do not oxidize vat dyes to their colored form with chromic acid. Instead, use heat and air. Some dyeing techniques have particular hazards due to the nature of the technique. This includes tie dyeing, Batik, and discharge dyeing. Batik involves applying molten wax to the fabric to form a resist pattern, dyeing the resisted fabric, and then removing the wax resist by ironing the fabric between layers of newspaper, or by the use of solvents. 1. Melting wax for batik can be a fire hazard if the wax is allowed to spill, or if it is overheated so that wax fumes form. Overheating can also produce decomposition of the wax to acrolein and other strong lung irritants. 2. Ironing out the wax often releases highly irritating wax decomposition products. 3. Carbon tetrachloride and gasoline have been used to remove residual wax from the fabric. Carbon tetrachloride is extremely toxic. It can cause severe cumulative and even fatal liver damage in small amounts by skin absorption or inhalation, and is also a probable human carcinogen. Gasoline is also hazardous due to the presence of benzene, a known human carcinogen. 1. See precautions in the section on dyeing. 2. Do not melt wax with an open flame or use a hot plate with exposed element. Instead, use an electric frying pan which can be temperature controlled, or melt the wax in a double boiler to avoid overheating and possible fire. Heat to the lowest temperature that will make the wax liquid. 3. Use an exhaust fan to remove wax fumes produced by ironing out the wax. Using several layers of newspaper may reduce the amount of fumes produced. Set the iron at the lowest possible setting. 4. Do not use carbon tetrachloride or gasoline to remove residual wax. Use mineral spirits, or send the piece to be dry cleaned after boiling in water. Tie dyeing involves the pouring of concentrated dye solutions over the tied fabric. 1. The pouring of concentrated dye solutions over fabric may involve the risk of skin or eye contact if the dye is splashed. 1. See precautions in the “Dyeing” section. 2. Wear gloves and goggles when tie dyeing. Discharge dyeing uses chlorine bleach or other chemicals to remove color from fabric. 1. Household bleaches contain sodium hypochlorite, which is moderately toxic by skin contact, inhalation, and ingestion. The use of bleach to remove dye from the hands can cause dermatitis. Inhalation of chlorine gas from bleach decomposition can cause severe lung irritation. Heating or adding acid releases large amounts of highly toxic chlorine gas; adding ammonia causes formation of a highly poisonous gas. 1. Do not use bleach to remove dye from your hands. Instead, wear gloves or a barrier cream to protect your skin. 2. Have dilution ventilation when using bleach. 3. Do not heat bleach solutions, or add acid or ammonia to bleach. Docker A., Wattie, .JM., and Topping M.D. (1987). Clinical and immunological investigations of respiratory disease in workers using reactive dyes. Br. J. Ind. Med. 44(8), 534-541. Jenkins, C. L. (1978). Textile dyes are potential hazards. J. Environ. Health 40(5), 279-284. National Institute for Occupational Safety and Health. (1983). Preventing Health Hazards from Exposure to Benzidine-Congener Dyes. DHHS (NIOSH) Publication No. 83-105. NIOSH, Cincinnati. * Adapted from Chapter 21, Textile Arts, of the 2nd edition of Dr. McCann's Artist Beware.